A few months ago, School Board member Eric Strucko shared that the Medical School staff of the University of Virginia had redesigned both learning spaces and approaches to teaching medical students. Later in the winter, the title of a blog post by Colorado high school educator, Karl Fisch, caught my attention. Karl co-produced the viral YouTube video series Did You Know? His post about the University of Virginia’s School of Medicine pointed out significant shifts in educational practice associated with its new Learning Studio. A Google search surfaced more online information about the radical innovation occurring inside “our” local medical school. I also spoke with a first year medical student about his work as a learner. Much of what he described as learning experiences this year reminded me of ongoing development work by Albemarle’s staff to better serve contemporary learners in our schools. Recently, several School Board members, all high school principals, some high school teachers, and central office staff toured the new facility and engage in an in-depth conversation with Dr. Randy Canterbury, M.D., Senior Associate Dean for Education and parent of graduates of Albemarle County Public Schools. In our tour, we also spoke with medical school staff responsible for working with students in the new learning spaces integral to the interior design of the Claude Moore Educational Building. The traditional coursework model has been turned upside down at UVa and stand-alone courses such as anatomy are no more. Instead, the new curriculum focuses on the critical nature of understanding and using integrated content relevant to working with patients. The curriculum no longer is a series of isolated content courses that lack important connections across disciplines. However, Dr. Canterbury noted that this wasn’t the only change that occurred as a result of program evaluation. Faculty planners realized that the entire medical education system needed to change to address the potential of contemporary learners as they prepare for future work in the medical field. This meant simultaneous changes in learning spaces, teaching, learning work, technology applications, assessment, and grading practices. As a result, the system has become focused on increasing learning engagement among the almost 200 students selected for the program from over 3500 applicants. Round tables support team learning according to Dr. Canterbury. Dr. Keith Littlewood, Director of the Simulation Center, also spoke to critical changes in learning work, “During my first two years in medical school, all I learned was rote regurgitation of content. Today you will see different access to learning … When learners believe in their learning, they invest.” Beginning with this year’s entering class, the School of Medicine no longer uses a lecture-based teaching model to deliver primary content such as courses in anatomy or histology. Students also aren’t moving through the 2×2 schedule still used by most medical schools and which has been in existence since the early 1900s. Students in a traditional model take courses for two years, then enter a series of “clerkship” rotations with patients that last two more years. Unlike peers in most other medical schools, UVa’s entering medical students no longer wade through rote memorization of isolated content coursework as their predecessors did. Instead, on the first day of medical school, this year’s class immediately was put to work in teams to analyze and problem-solve patient case studies. They’ve learned to pull relevant, interdisciplinary content into the case as they work, facilitated by a team of professors or a professor with responsibility for their half-day Learning Studio class. Learning digital content critical to the practice of medicine is assigned for homework and a daily five-minute “quick check” on that content occurs at the beginning of class. Based on actual data from prior years, UVa faculty knew that medical students were more likely to skip lectures than attend them. We learned that this group of first-year medical students attend learning studio sessions at higher rates than their predecessors attended lectures. Dr. Canterbury attributes this to what’s become known as a “flipped classroom” approach to learning, a new concept applicable in both higher ed and PK-12 education. 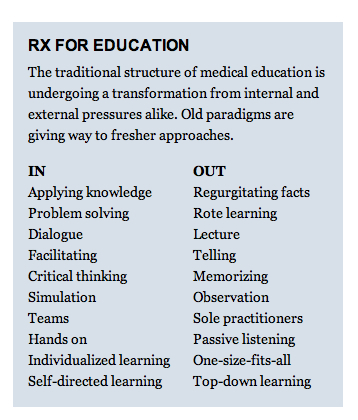 Learning through this model has made medical education classes more rigorous, but also more engaging as students work to apply, analyze, synthesize, and evaluate relevant content in and outside of class. Under this system, students accumulate points from assessments over eighteen months. Missing a class could mean a student won’t acquire points for a quiz that might be worth five points out of a 1000 possible during the year. In shifting to a standards-based assessment system, the medical school staff has eliminated variables used for grading that have little to do with actual performance on assessments. The new program also represents a new generation of learning technology applications. These technologies are as relevant today to Pk-12 education as to higher education and post-graduate programs such a medicine, business and law. 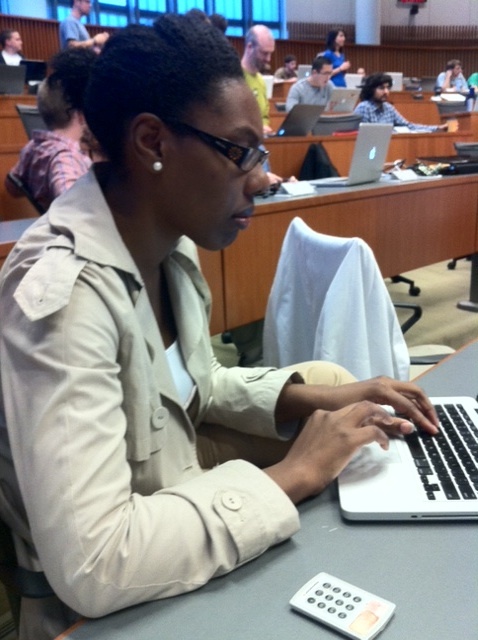 Students aren’t using paper textbooks in the new medical school program. They access digital content on laptops or mobile devices, using either publishers’ multimedia materials or digital content developed by the medical school staff. In their classes, they respond to questions as a group using interactive assessment technology, project their work onto one or more large screens, and work together simultaneously on team-based web content. 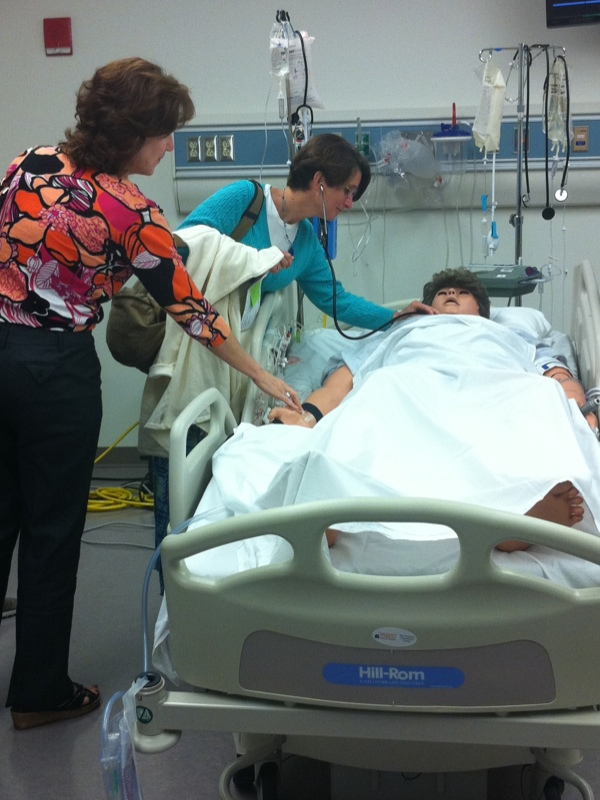 In the Simulation Center, students work in teams with full-body mannequins that can simulate real-life medical conditions or emergencies. Students can practice emergency skills, surgery skills, or routine diagnostic skills that parallel real conditions to such a degree that the “docs in training” physically respond with changes in heart rate and blood pressure just as they would in actual practice. New technologies also provide access to 3-D anatomy simulations that provide a more realistic point of view of the human anatomy than cadavers ever did. 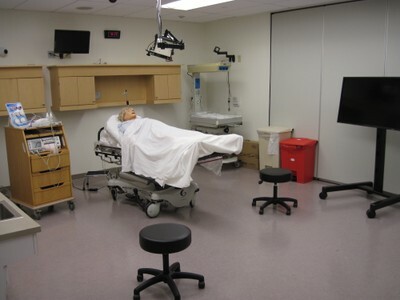 Students working together in the UVA Simulation Center can be observed from multiple screens and given guided feedback by the faculty during and after simulation work. The immediacy of such feedback allows students to improve performance in real-time. 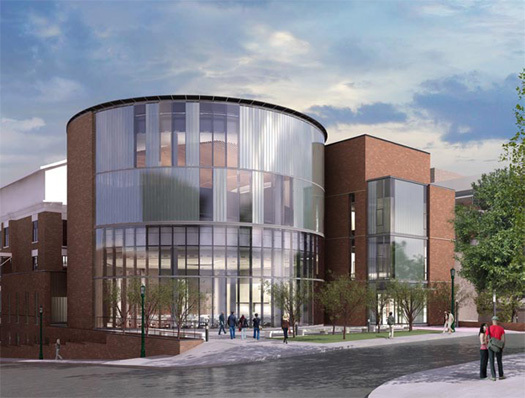 Before the new medical education building was constructed, the design team scoured the country to look at innovative learning spaces in higher education. The TEAL space established at MIT had become a model for changing the education game by redesigning learning spaces to drive a different kind of teaching and learning. Interestingly, MIT borrowed and refined this concept from NC State as a strategy to decrease the failure rate in freshman physics, dropping it from ten to one percent in one year after implementation. The UVA School of Medicine has taken the TEAL concept one step further by creating a large space in which the entire first year class works together in team-based learning. Staff made key shifts including changes in lighting, furniture, and, most importantly, elimination of the dominant teaching wall that supports lecture-driven rote learning. The use of case analysis has emerged as a contemporary, best practice in highly competitive business, commerce and law schools as well as in some independent secondary schools. Rather than being anchored by a dominant teaching wall, the UVa Learning Studio utilizes multiple presentation spaces that allow faculty to cycle from small group case study to large group learning as appropriate. It’s a room filled with round tables wired into the presentation system, all surrounding a high-tech lectern in the middle of the room. Why such a team-driven focus? Dr. Canterbury noted in his discussions with Albemarle staff that making changes of this magnitude occurs best when people are engaged in the work and direction is set clearly for the change. He spoke of the need to respect people in the process, but also that moving forward was essential once the direction had been researched and planned. He also noted that change occurs effectively only with significant investment in development of capacity among those responsible for implementing the changes. The faculty members working with the first-year medical students have been involved in no less than 160 hours of development and training in pedagogy to teach the newly designed curriculum using new technologies in a new learning space. The commitment of resources to the change process has been critical to implementation this year, although he noted that schools across the country use a range of technologies and spaces to create their version of Technology Enhanced Active Learning (TEAL) opportunities for learners. Dr. Canterbury also emphasized the importance of ongoing evaluation to assess the quality of implementation processes. The School of Medicine of the University of Virginia is considered to be one of the most innovative learning programs for current medical students in the United States today. It’s an example of educational innovation in which current learning technologies, best-practice pedagogy, rigorous interdisciplinary content, project-based learning work, and contemporary learning space design are integrated to engage learners in interactive learning. Faculty leaders believe this new learning model will take students to higher levels of performance than ever before. The medical school staff members leading for change are committed to realizing a dream to create a new generation of practitioners who serve patients with greater capability than was possible in the past. The rationale for the changes made by the planning committee parallels focused action to shift towards similar practices in Pk-16 education across the world. The capability to learn independently, work in teams, demonstrate effective communication skills, problem-solve, and use technology as learning tools are considered basics by the business and medical community as well as in post-secondary education settings. These are today’s workforce basics, regardless of the position held. These college and workforce basics also are represented in the Lifelong Learning Standards for graduates of Albemarle County Public Schools. The visit to the School of Medicine reinforced the importance of the Lifelong Learning Standards and also provided a fresh perspective on what we need to consider to ensure our future graduates are ready for the changing environments of the workforce and colleges and universities as we continue forward into the 21st century. for sharing their work with our Board members and staff.